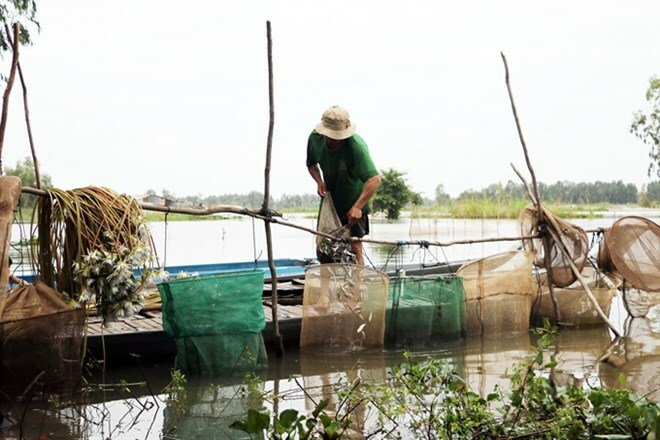 A farmer catches fish in Nhon Hung Commune, Tinh Bien district in the southern province of An Giang. Floods in the Mekong Delta are expected to occur earlier this year. Besides the heavier rainfall, the water levels measured in the Mekong riverhead during the dry season were 0.45 - 0.55 metres higher than average, according to the centre. By the end of July, water levels at Tan Chau and Chau Doc stations are expected to be 2.5 - 3 metres high. This year’s flood peak is expected to occur in the first half of October, at levels 2 and 3 (the Tien River in Tan Chau station, from 4.0 to 4.5m; and the Hau River at Chau Doc station from 3.5 – 4.0m). The 2017 flood peak is expected to be nearly the same as last year and previous years. However, there is a risk of floods rising faster than normal this year, due to heavy rains occurring for many days in the upper reaches of the Mekong River, the centre said. Early flooding could occur in Tan Hung and Vinh Hung districts in Long An Province and some riverside areas in An Giang and Dong Thap provinces. Le Thanh Tung, deputy head of the southern office of the Cultivation Department, said that farmers might not be able to harvest rice before the floods arrive. To minimise the damage caused by the floods, the centre has recommended that localities closely monitor the hydrological situation in the Mekong Basin via media reports. Meanwhile, the northern and central regions could face forest fires in the dry season this year, according to the centre. The Vietnam Administration of Forestry under the Ministry of Agriculture and Rural Development has also warned about the risk of forest fires in many localities.